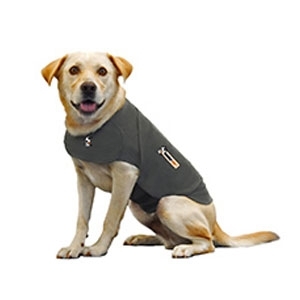 Thundershirt is an excellent treatment for most types of dog anxiety and fear issues. For many anxieties, we recommend just putting on a Thundershirt and observing the results (No training!). You very well may see significant improvement for noise, crate, travel, barking and others with absolutely no training. For more complicated anxiety cases, we recommend using Thundershirt as part of a behavior modification program. All sizes and a variety of colors in stock.